Personal Injury Auto, Truck and Motorcycle cases and Workers Compensation On the Job injuries. Traffic cases including DWI, Driving While License Revoked, Speeding, and all other highway offenses. General Criminal Representation for Felonies and minor charges. Divorce, Child Custody and Visitation, Separation Agreements, Alimony and Post Separation Support and Alienation of Affections. General Civil Litigations in Estates, Commercial Claims, Civil Lawsuits of all Kinds. You can always call Woody Bowen: Office 910-739-4357 Cell for emergencies or off hours: 910-991-6582. 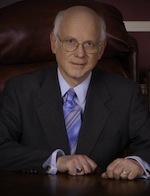 Woodberry Bowen has fourty years of practice experience both as a state's prosecutor and as a defense attorney. He appears in all divisions of North Carolina trials courts and in the Federal Courts. "Woody" concentrates his practice in several fields.